Q: What size motorhome is right for our vacation? A: There are "Class A" and "Class C" type units. This designation is primarily a way to distinguish the type of chassis that the motorhome is built on. Class C units are built on a van chassis and have the distinctive "van" looking front end. Most people have the impression that Class A units are larger. Since there are Class C motorhomes that are longer than some Class A motorhomes, this is not strictly true. Class A coaches do tend to be longer and have deeper slide-out rooms. This extra volume combined with a more open cockpit area does make Class A motorhomes feel more spacious. Whichever style you choose, be aware that very few RVs have more than seven seat belts despite their large size. The primary difference is that Class C motorhomes typically have better sleeping capacity because of the queen size bed above the cab. 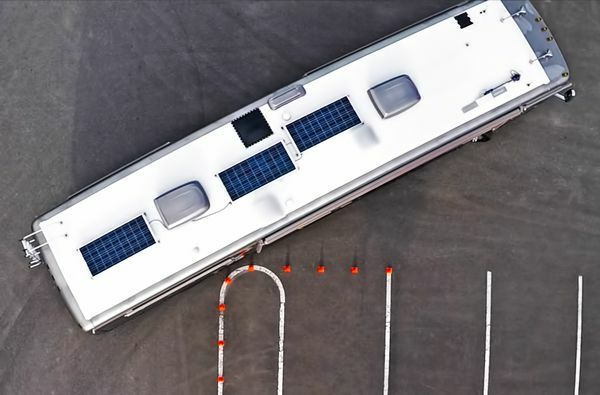 There are exceptions to this rule of thumb, however, since some Class A motorhomes are now being equipped with electric "drop down" beds that give back the extra sleeping capacity usually found in a Class C motorhome. ​Remember, convertible sleeping areas like folding couches (Sofa Futons) and dinettes are usually suitable for two children or one shorter adult. Use our comparison chart to help determine the size that's right for your group. Q: Is it difficult to drive a motorhome? A: Driving a motorhome does take additional concentration until you adjust to the extra width, length and height. Most "fender benders" involve an RV and an immovable object like a fuel station guard post. We help our customers during the orientation period to be aware of a few simple guidelines that will greatly decrease the chance of a mishap. New drivers need to understand that the motorhome "pivots" around the rear axle. No turn should be initiated until the rear axle is even with or past the intended turning point. Another avoidable accident happens when backing the RV into an area with obstructions. Modern aids like back-up monitors help improve the odds, but a person stationed at the rear of the motorhome in visual contact with the driver is almost a guarantee against this type of accident. We take the time and have the experience to go over these and many more driving tips with our customers during the thorough orientation period before their vacation. Q: Why would I rent from Hometown RV versus a national chain? ​A: When all costs are included in a "bottom line" quote, our units typically rent for the same or less than national chain RVs. Price, however, is where the similarity ends. Since we do not offer one-way rentals, our units are specific to our location. Rather than relying on luck-of-the-draw the day you pick up your RV, you can view and choose the actual unit you will get! Our coaches never have "1-800 Rent Me" signs or any other exterior advertising. Our rental motorhomes are owned by private individuals. They are definitely not generic rental units. Our ability to assist our rental customers and provide technical support is far superior to what a chain rental company has to offer. 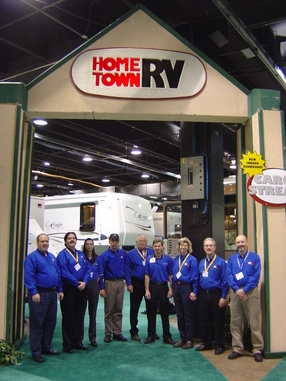 We are a full service RV dealership and have the know-how to help solve most operator related problems over the phone. Our dealership has serviced chain rental units and we can attest to the differences first hand. Our rental operation is not an "add-on" business like a gas station offering rental trucks. RVs are our only business and we believe that our rental customers can tell the difference! Q: How much does it cost to rent a motorhome? Our Rate Chart allows you to estimate your trip costs. Our Comparison Chart can help to narrow down the options. Q: What happens if our motorhome breaks down? It is extremely rare for RV engines or transmissions to fail. Recreational vehicles are built on heavy duty truck chassis that routinely see many more miles and much more severe duty than when they are used in RV applications. If a rental customer experiences an appliance failure, there may be a back up system on board. The majority of issues are simply due to an unfamiliarity with the various systems and how they operate. We pride ourselves in providing effective technical support over the phone. The majority of operational problems are solved this way. It is comforting to know, however, that we do provide access to roadside assistance in the event that it's needed.